It’s been a hectic six weeks since I returned from the UK. Lots of things to catch up with and attend to – so many different things that needed doing… and yet this has helped in part, to distract me from the sadness of losing my Mum… I really miss her. 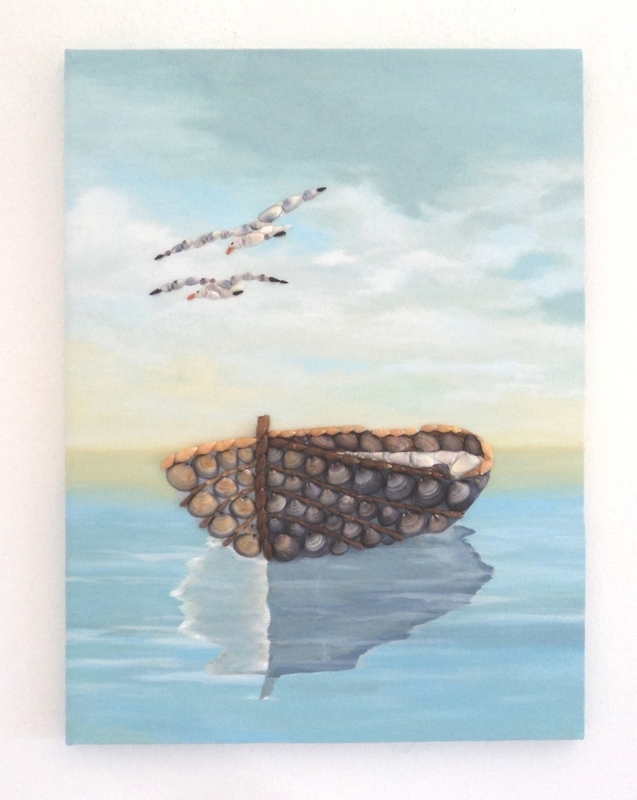 Fishing Boat & Seagulls in Seashell Mosaic – 30 x 40cms – Available to purchase from my Etsy shop. 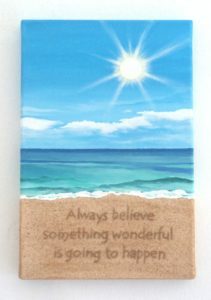 Helping me cope with my grief, I have enjoyed getting seriously back into my Art and I have created a few new designs as well as building my stock for the coming summer beach selling season. This has been so therapeutic for me and has lifted my spirits enormously. I have also been ordering seashells from my regular suppliers and enjoyed cleaning and sorting them all, ready for use in future seashell mosaics. 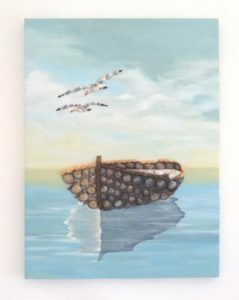 However I have been so absorbed in creating my Seashell Mosaic Collages that I have missed out on all the fun going on in February and March! Carnival and Clean Monday went by without me really noticing! I just haven’t been in the mood for partying. However I did make an effort and went to Mary’s 60TH Birthday Party at Vangeli’s last week, so I have not been a complete hermit! One of the most wonderful activities I absolutely love doing is to go beachcombing! I just have not had the time to do this these past 18 months, but I have surely been making up for it during the past 6 weeks! Winter is always the best time to beachcomb, after storms and when the beaches are deserted. I love to explore the fabulous coastlines around Crete, taking in all the stunning scenery and gathering sea treasures to use in my Seashell Mosaic Collages. These recent beachcombing trips have lifted my spirits like nothing else can! We’ve had some pretty severe storms since I’ve been back. 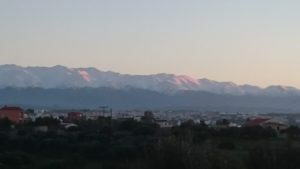 This beautiful Island of Crete has certainly taken some battering and in the Apokoronas area of Crete where I live, old bridges have come crashing down and floodwaters were everywhere! Chania Harbour Front was seriously damaged – I saw for myself when I spent a day there recently, with Debbie. We spent some time looking around the shops and buildings in the little cobbled back streets behind the Harbour. 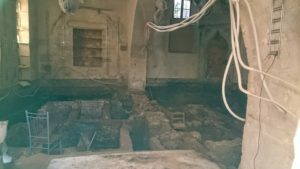 An old shop in Chania, revealing another building underneath – fascinating! When we came across a shop that looked like an archaelogical dig! The floor had been completely removed and underneath it they found remains of ancient walls set like buriel tombs. When we looked closer (no-one else was around!) we saw that it must once have been a small mosque. It was fascinating! We wondered whether the recent storms and floodwaters had created the damage to the shop. Either way – it didn’t look like it was going to be open for business again – anytime soon! I must say that the storms didn’t affect me as luckily, my home is situated so high up that water drains easily away – it’s the wind I have to be wary of! But I do love to watch a good storm from my balcony overlooking the sea. 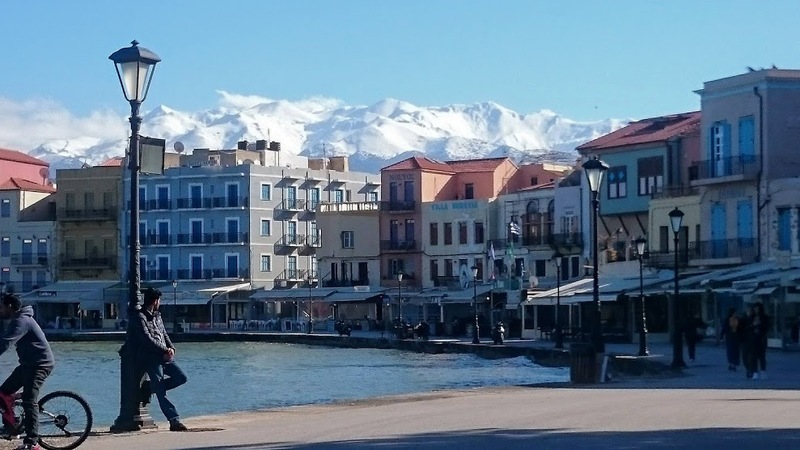 Chania Harbour Front, with the White Mountains behind – stunning in reality! 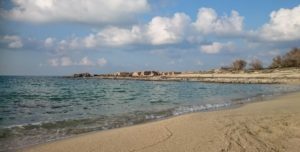 Whilst in Chania we couldn’t resist taking a quick look at Neo Chora beach, which is only a 10 minute walk or so from the Harbour. We ended up spending a couple of hours exploring the beach there! It was really interesting and we found some good stuff. With that 2 hour distraction, we didn’t return to the Harbour Front for lunch until about 4pm, by which time we were starving! In between these storms, there have been some wonderful warm and sunny days that are just perfect for beachcombing. Even better still is that in the winter, Crete’s deserted beaches are filled with interesting and fascinating things to find after a storm. Last October, Lisa introduced me to Debbie and I have to say she is the best beachcombing buddy I’ve ever had! She’s just like me and loves nothing more than spending time exploring beaches and collecting fascinating things that have been washed up on the shore. Debbie will notice fossils, skulls and bones, sea glass and countless other interesting objects as well as shells. Whereas I am always concentrating on the seashells, since I have been beachcombing with Debbie, I’ve started to notice all the myriad of other sea treasures to be found! The driftwood after a storm is quite phenomenal and so I couldn’t resist taking many samples to incorporate into my artworks in some way. One of Marathi’s beaches. Again – the White mountains in the background are stunning! 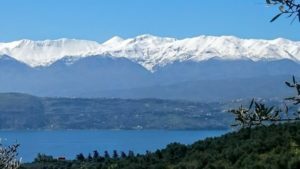 The fabulous beaches we have visited in the last month have been Stavros (twice), Bali (twice), the furthest parts of Georgioupoli, Frangokastello, Marathi, Loutraki and countless other beaches we found in between. We’ve had a fabulous time scrambling about over rocks, across river and sea streams, having such a laugh and feeling like we were kids again! I know I am hooked on beachcombing, I have a real addiction for it! 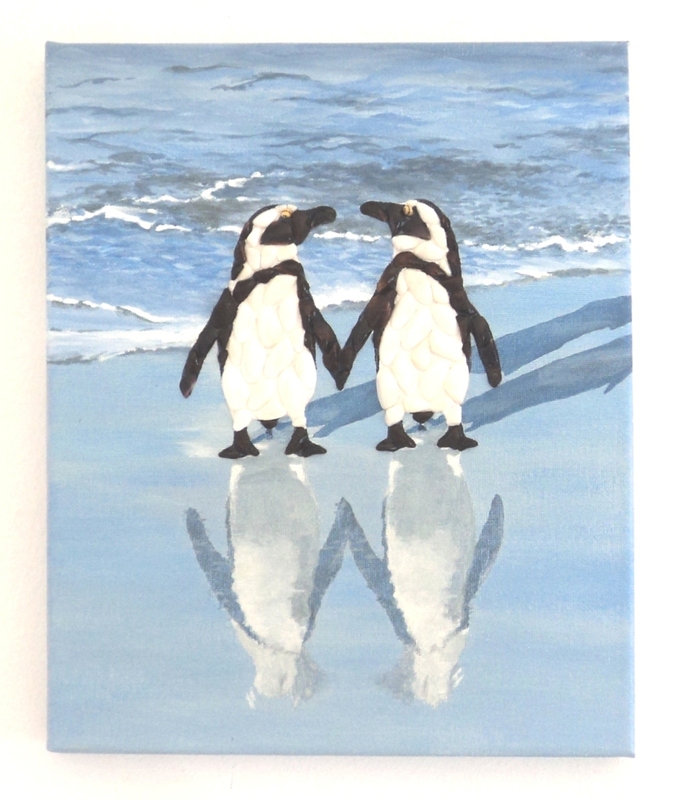 Now I am busy getting everything ready for my summer beach selling. 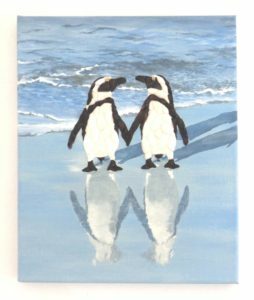 My sales leaflets needed updating and reprinting, new display boards putting together and of course, plenty of new artworks for the coming busy tourist season. I am really looking forward to the summer and especially excited about Zoe, Emma, Ralph and Neve’s visit at the end of next month! PS There simply isn’t enough room above – to put up all the fabulous photos of the wonderfull views and places we enjoyed while driving along between beaches. Here are some of the wonderful photographs Debbie took on our recent beachcombing trips. An after sunset view of the ‘pink’ Mountains on the way back from Bali. Askifou, the plateau high in the mountains. 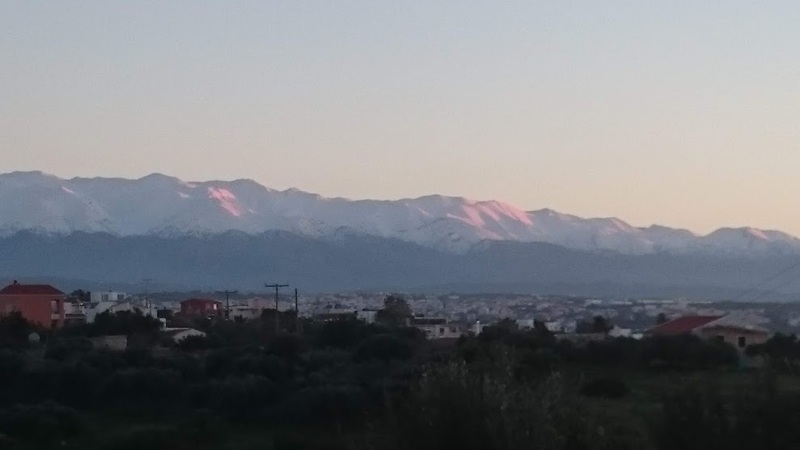 Leaving Askifou Plateau, the sunset turning the White Mountains pink! Wherever we went, there was no escaping the awesome White Mountains! I’ve been having such a cool time beachcombing with you, Michaela. I think it’s typical of both of us that a day out shopping in Chania spontaneously included a couple of hours on the beach, ankle-deep in seaweed, picking up shells and stuff. Our beach haul was heavier than our shopping! I went shopping in Kalyves yesterday and spent a couple of hours on the beach, though I did manage to arrive home with more shopping than beach this time 🙂 . Looking forward to a day at Phalasarna on Monday! You certainly say it like it is.. how we share a passion for beachcombing! Yes, can’t wait for Monday, when who knows what adventures we’ll have or what we may find?